SAN FRANCISCO - RSA Conference – April 16, 2018 – Sonatype, the leader in automated open source governance and DevSecOps, today published findings from its 5th annual DevSecOps Community Survey of 2,076 IT professionals. The survey shares practitioner perspectives on evolving DevSecOps practices, shifting investments, and changing perceptions. Survey respondents with mature DevOps practices were 338% more likely to integrate automated security than organizations with no DevOps practice. After another record year of breaches, analysis of responses found that 3 in 10 organizations suspected or verified breaches stemming from vulnerabilities in open source components -- a 55% increase over 2017, and 121% increase since 2014. This year’s survey also found that investments in open source governance (44%), container security (56%), and web application firewalls (58%) were noted as the most critical to organizations pursuing DevSecOps transformations. “As application breaches tied to open source components jumped more than 50% year over year, those investing in DevSecOps showed 85% higher levels of cyber readiness, compared to those who aren’t,” said Wayne Jackson, CEO of Sonatype. “It’s evident that recent high profile breaches have heightened investments in DevSecOps. The survey also revealed strong investments from organizations striving to stay ahead of May 2018’s ‘secure by design’ requirement stipulated within the EU’s General Data Protection Regulation (GDPR)”. 77% of mature DevOps organizations have open source policies in place, with a 76% adherence rate. Conversely, only 58% of respondents without mature DevOps practices had a policy with a 54% adherence rate -- revealing that adding automated governance to DevSecOps is difficult to ignore. 59% of mature DevOps organizations are building more security automation into their development process as attention toward GDPR compliance grows. 88% of those with mature DevOps practices are investing in application security training, while 35% with immature practices said they had no access to security training. This finding points to stronger cybersecurity readiness postures of those investing in DevOps. 63% of respondents with mature DevOps practices say they leverage security products to identify vulnerabilities in containers, as these components become more ubiquitous in modern IT landscapes. 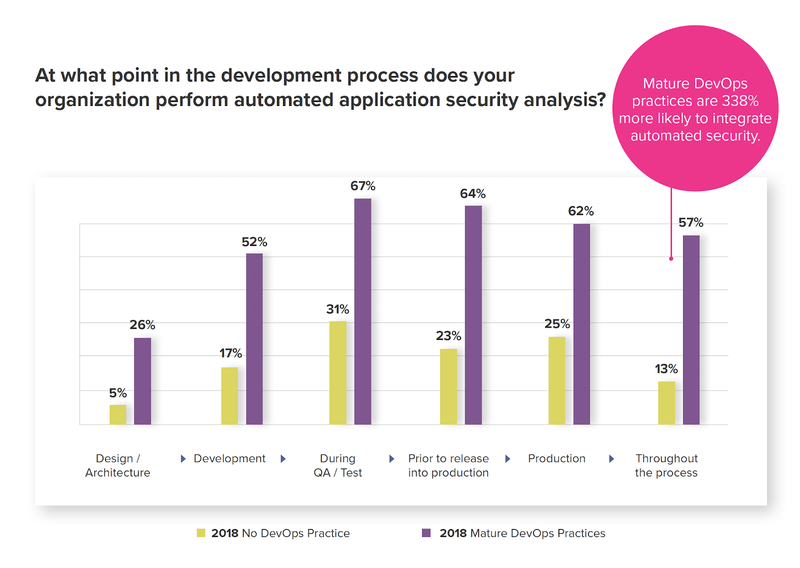 48% of respondents admitted that Developers know application security is important, but they don’t have the time to spend on it, shedding light on the growth in automated security investments. The 2018 DevSecOps Community Survey provides visibility into the attitudes of software professionals toward DevOps best practices and the changing role of application security. The survey was conducted by Sonatype, Carnegie Mellon’s Software Engineering Institute, Contino, DZone, Ranger4, SJ Technologies, and Signal Sciences. The survey’s margin of error is ±2.02 percentage points for 2,076 IT professionals at the 95% confidence level. More than 10 million software developers rely on Sonatype to innovate faster while mitigating security risks inherent in open source. Sonatype’s Nexus platform combines in-depth component intelligence with real-time remediation guidance to automate and scale open source governance across every stage of the modern DevOps pipeline. Sonatype is privately held with investments from New Enterprise Associates (NEA), Accel Partners, Hummer Winblad Venture Partners, and Goldman Sachs.